Product prices and availability are accurate as of 2019-04-19 03:40:52 UTC and are subject to change. Any price and availability information displayed on http://www.amazon.com/ at the time of purchase will apply to the purchase of this product. The grass is truly greener on the other side with the Sorbus Interlocking Grass Tiles! Make a meadow out of your deck, patio, or balcony with grass carpet tiles that combine the softness of EVA foam and durability of artificial turf. 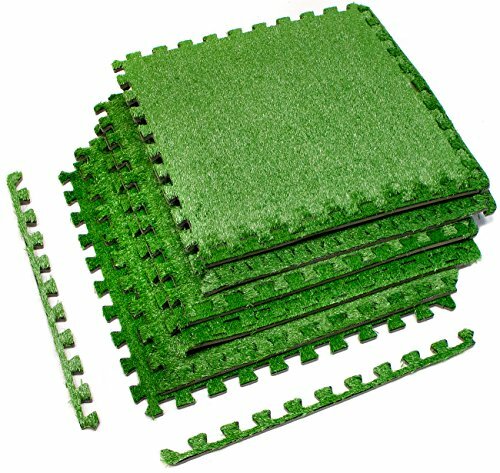 It features foam tile pieces that soften your indoor/outdoor space with the look of real grass so there is no need to add water, fertilizer, or pesticides! Outdoor carpet grass interlocks with a simple jigsaw puzzle connection for a secure, seamless look and can be easily expanded with additional tiles as your space grows. In a few short minutes, you can create beautiful protective flooring that last for seasons of enjoyment. Whether you're decorating a patio or need a padded play area for kids, these interlocking mats are versatile enough to be used almost anywhere! Revamp your outdoor living space! Artificial turf tiles bring a natural, comfortable look to any patio, terrace, or balcony and perfect outdoor entertaining. They install in seconds for an impromptu barbecue on the deck or rooftop garden retreat with tables and lounge chairs. With this amazing set up, guests are sure to be green with envy! Indoors, update a playroom for kids or add to your home gym to protect both your floor and exercise equipment. Tile mats are also suitable for party tents, wedding tents, canopies, trade shows, conventions, office, gym, daycare, and more. Faux grass tiles can be installed both indoors/outdoors to ensure a safe floor surface for everyone. Enjoy Easy do-it-yourself installation with no adhesive needed. Detachable edge pieces allows any tile to be a corner, border, or center. Install in specific areas or wall-to-wall. Printed Film material is OPP 100% Plastic, Mat is 100%PE. Durable enough to withstand common foot traffic. Waterproof.